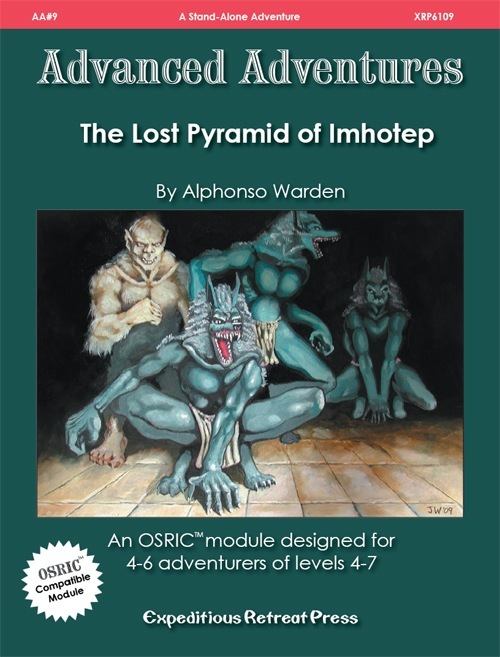 The Lost Pyramid of Imhotep is an OSRIC module designed for 4–6 adventurers of levels 4–7. Several months back, a small boy from the village of Ab-Amon happened upon a buried column while playing out in the surrounding desert. He reported to the village elders that the column bore strange and frightening symbols that he, in his youthful exuberance, insisted were curses. Being as the boy was known to have a photographic memory, he was able to accurately draw the queer symbols for the village elders when asked. The elders, being somewhat familiar with the ancient history of their region, quickly came to the realization that the symbols must be associated in some way with a pharaoh, for they were enclosed by a lozenge-shaped border. Even though they lacked the ability to directly translate the ancient hieroglyphics, they did realize that such a design, a cartouche, was used to spell out the name of the pharaoh along with all of his royal titles. Perhaps, just perhaps, the local wizard reasoned, the pillar could be linked to the tomb of the master architect Imhotep, whose final resting place has never been found. This module clocks in at 13 pages, 1 page front/back cover, 1 page editorial, ½ a page SRD, leaving us with 10.5 pages of content, so let’s take a look! As always for the series, we have OSRIC as the default old-school system employed, and there are a few formatting deviations. Adaption to other old-school systems is pretty simple. So, let me preface this review by stating one thing: The complex depicted herein is an inverted, subterranean pyramid, and this module has been penned by the same author as the utterly atrocious “Prison of Meneptah” – without the request by my patreons, I would not have bothered reviewing this, as I derive no satisfaction from trashing other people’s work. I am, as a whole, happy that this was requested, for while this can be construed to be a “bad” module in some regards, it can be rather intriguing for the right groups. Now, the first thing you need to know, is that this hasn’t seen playtest – that much is pretty evident. The level-range noted, level 4 – 7, is ridiculous. Even at level 7, this adventure is exceedingly difficult and lethal. At the same time, however, much of this difficulty is derived from the demands the adventure has on the PLAYERS. The angle is pretty simple: The PCs are hired to dig down at a hypostyle in a quasi-Egyptian environment. Now, the pdf does note that PCs won’t necessarily understand hieroglyphs they find; either they are locales, or they have a scholar on call that can slowly translate these. The adventure is probably not something the PCs can clear up in one go. There is a good chance the PCs and players will ram their heads against the solid brick wall of difficulty this adventure constitutes. Now, the “quasi” prefix of “quasi-Egyptian” is one potential weakness of the adventure that may well disqualify the module for your game: You see, being “close” to Egyptian does not suffice – the modules REQUIRES a VERY close analogue to real world Egyptian mythology and customs. It also requires that the players know a lot about the subject matter – and I mean A LOT. As such, if your group tends to differentiate sharply between character and player knowledge, you may consider this adventure to be problematic, to say the least. As far as the dungeon is concerned, we do not have a lot of combat going on, which is a good thing here, as this is where the rules tend to falter badly; instead, we have a distinct focus on cultural puzzles and set-pieces. While the adventure is EXCEEDINGLY linear, the complex does not suffers from the sucky “Door closes, save or die” and “can’t use your tools” asinine design decisions of Meneptah’s prison. There is a stringent, internal logic to this adventure. That being said, I consider this to be top tier difficulty and only an adventure that should be attempted by roleplaying game veterans, and only by groups that have at least one member that has PhD-levels of knowledge regarding Egyptian culture/archaeology/anthropology. I am NOT kidding, but in order to elaborate upon this fact, I will need to go into SPOILERS. Potential players should jump ahead to the conclusion. So, as the name implies, legendary Imhotep constructed this pyramid. Think of the fellow as a wrld-weary demigod-level magical architect, and that is EXACTLY how he designed this complex. This is steeped in myth and as deadly as you’d expect. In the first proper room, we see locust-like flying devices, which would allow for the spanning of a vast pit. An inscription tells the PCs to become like Apshai and do aerial battle – and indeed, enter the 2-seater locust constructs initiates an aerial battle with analogue constructs attacking from the opposite side of the vast pit. While we are told about ammunition, how you tilt the joysticks to move them, etc., and ramming notes, neither ammunition, nor ramming damage are codified regarding the damage they inflict. While you can theoretically try to extrapolate the damage from the stats of the flying constructs, these have 3 attacks, with one dealing much more damage…which I assume is supposed to be the collision damage. Then again, the shots + collision will usually not be triggered in the same round, so ultimately, I was left utterly puzzled by how these are supposed to work. It’s not hard to improvise rules here, but yeah. Bad crunch design. Neither does the pdf note how many piece of ammo they can fire, their worth when removed, etc. Oh, and since the PCs aren’t accustomed to using these, they take a -5 (!!!) penalty to attack rolls. WTF. The smartest choice here is to activate the hostile constructs, hang back and shoot the incoming constructs out of the air. There is nothing that RAW prevents this, in spite of the note. Room 2 has a statue that requires in-depth knowledge regarding Egyptian mythology and beliefs. 4 questions must be answered to pass, and here, all groups that don’t have this IRL-knowledge will probably be annoyed. “Who records the judgment of Osiris?” “In man, where does the seat of wisdom reside?” Those are two of the 4 questions, and if you’re not really into the nit and grit of ancient mythologies and the like, there is a big chance that this may grind the game to a halt. This is, as the ardent scholar may know, based on the Book of the Dead, and indeed, I strongly recommend a copy on hand when running this adventure. As the PCs venture further, they will have to place vanquished undead within the mouth of Ammit, Eater of the Dead, as one further example of a relatively…”simple” task. It is in these that the module manages to evoke a concise atmosphere, manages to feel like it indeed is a proving ground made for the aeons. That being said, when the more mundane aspects are concerned, the adventure is less inspired – for example, a prismatic spray trap in a chest? At this level? That’s just nasty. There is another “insect-vehicle”-battle scenario herein, where the PCs pilot basically a scarab tank, which alas, suffers from pretty much the same issues as the previous locust-encounter, but which should definitely be won: The scarab tank is the only means to reliably navigate a vacuum corridor, though thankfully, if destroyed, the PCs can still brave it – though that, indeed, is a save or die. The complex includes a Ra-themed mirror puzzle, a game of senet (yep, rules provided), rope-pulling with Set to balance the forces of good and evil, and PCs will have to bake sacred mefekezet bread to proceed. And no, if they have no idea what to do…well, bad luck. As noted before, this is not a forgiving module and requires extensive knowledge on part of the players. Oh, and know what’s really sadistic? That mirror puzzle? Well, you need the sacred Benben stone to activate it. That stone, though? Slightly radioactive. Scratch that. Frickin’ radioactive. 1d4 damage every TURN. In a radius. No, the PCs are not told where that comes from. The stone’s on level 1. And while the levels are brief, it’s used on level 3 and the puzzle-heavy nature of the scenario will result in delays. This is just sadistic and requires very methodical players to solve. Clever deduction can zero in on the source, sure…but ouch. The Pcs will also need to extract a bulb from the serpents of wisdom and survive battle with them…and if they don’t learn from the stone and don’t take the bulb along, they may be screwed. You see, there is an intricate, undetectable trap called “birthing of cosmic eggs” that will grind them to a pulp. It also seals the PCs in the area, and if they don’t have the bulb…well, tough luck. This trap is conceptually really interesting, but try as I might, perhaps due to the map, I couldn’t envision it – having a visual representation of the room would have been really helpful here – I kinda suspect a miscommunication regarding cartography here. Ultimately, the PCs have to bypass multiple elemental walls (note that excess oxygen can poison you…) and make their way to the top of the inverted pyramid, which hangs from the ceiling in a vast flooded cavern: With the bulb, they can activate the barge towards Imhotep’s true resting place – provided they’re not eaten by giant crocodiles. Imhotep himself still awaits the worthy and rewards the PCs with something that is indeed in line with the challenge: Immortality. Editing and formatting are good on a formal level; on a rules-language level, we have several pretty nasty issues crop up. Layout adheres to the classic two-column b/w-standard and the b/w-artworks provided are solid, if perhaps chosen for the wrong components. Cartography is a no-frills b/w and functional, though, as noted, one map is a bit weird, to say the least. There are no player-friendly versions of the maps included. The pdf comes fully bookmarked for your convenience. Okay, to spell that out loud and clearly: This is not a well-designed module. The rules are problematic, the challenges uneven and deadly, and without out-game information or a scholar on call, the PCs have next to no chance to solve this with in-game logic. This is brutal, linear and harsh and fulfills pretty much all aspects of game-design that I’d consider to be bad. Here’s the thing: For a VERY specific target demographic, this is frickin’ amazing. And, alas, I am part of that target demographic. I once created a puzzle where the PCs had to assign a gigantic astrolabe to duplicate the constellations of a specific event that required a thorough understanding of the respective mythology. And my players like that kind of cerebral, lore-heavy problem solving. This adventure is extremely well-researched in pretty much every way; it often feels a bit like a point and click adventure and is horribly linear, yes. It is also horribly lethal. In fact, most folks should probably consider this to be a 2 star adventure at the maximum. Most groups will absolutely LOATHE this and should steer clear. That being said: If you and your groups enjoy clever puzzles AND you are well-versed in mythology and culture AND your players are roleplaying games veterans that enjoy a brutal challenge AND they are the type that can approach a dungeon methodically AND you’re willing to improve on the flawed rules, then this can be AMAZING. I all of these components hold true for you and yours, then this can be a truly unique and captivating experience that will go down in the group’s annals. Alphonso Warden’s “Lost Pyramid of Imhotep” is, in a way, like a really inaccessible cult movie or book that was written for a very niche audience. A niche audience I happen to know very well. Let me state that clearly once more: You should NOT get this module if all of the above doesn’t appeal to you, if you want mechanical perfection, etc. This is, when examined for its virtues of game-design, structure, etc., not a good module. However, if you do love your mythology; if your players like challenges and are well-versed in ancient cultures or would enjoy you handing them the Book of the Dead as a kind of “research-handout”, if that type of thing sounds cool to you, then chances are that you’ll enjoy this far more than you should. As a person, I had a blast with this module! I really did! I am very cognizant of its copious flaws, of its massive issues, but it’s creative, smart and deadly – and if this sounds like it’d tickle the fancy of your group as well, then check this out. For you, this may even be as high as a 4 or 4.5 star-adventure. Now, as a reviewer, I can’t bring myself to rate this down as much as I probably should; after all, there is a very specific appeal in these pages. I can’t rate this twice. Hence, my official verdict will be 3.5 stars, rounded down – though I strongly suggest you instead consider this to have the verdicts I mentioned above, depending on your proclivities. For the very niche number of groups that this appeals to, it will do so in a thoroughly compelling manner.